Fungi growing on grapes may contribute to flavor differences between post-harvest grapes from the same vineyard, Phys.org reports. A new study sent researchers to three adjacent, well-established vineyards: traditional, organic and biodynamic, to sample the aromatic and fermentative qualities of the grapes. 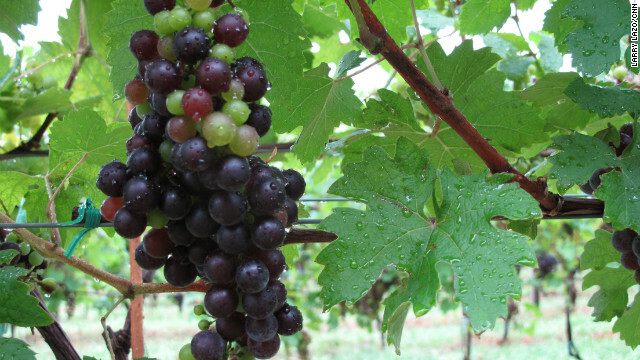 The least treated vineyard had more variety of fungal species than the others, but the researchers noted that temperature and sun exposure greatly influences the type of fungi present on the grapes. Sommeliers, take note: Your idea of the best wine may depend on microbes! Birdsong: Is it really music? A new Emory University study suggests that when female white-throated sparrows hear a male’s birdsong during breeding season, the same reward system in the brain is activated as when humans listen to music they enjoy, ScienceDaily reports. Neural imaging maps show and compare neural responses to these signals that are “evolutionary ancient mechanisms necessary for reproduction and survival,” according to researcher Sarah Earp. This suggests that birdsong and music may have similar functions or evolutionary precursors, but there are limitations - many brain regions in humans that respond to music are not found in birds. The New York Times notes that while the National Institutes of Health is tapering its use of chimpanzees in biomedical research, it is having financial difficulty in placing retired chimps into retirement facilities and sanctuaries. Sanctuaries like Chimp Haven in Louisiana provide retired chimpanzees with a more natural environment and social setting than research institutes. The organization says the monetary cap to move and support these chimps will likely be reached this fiscal year. Researchers in Cuba have uncovered two new species of orchid, ScienceDaily reports. Many orchids have a special type of reproduction, called "deceit pollination," relying on their colors and shapes to attract insects and birds, not on nectar or other substances. One mystery the researchers are trying to solve is whether deceit-pollinating orchids have greater diversity than other nectar-producing species. By examining the flowers’ petal shapes and sizes, they’re also trying to determine their evolutionary relationship with those on a neighboring island. I was unaware with the fact that Fungi produce variances in wine grapes.It can create disease or can be harmful to the one who intake it.